By entering my name below, I certify that the information on this application is correct and I understand any misrepresentation or omission of any information will result in my disqualification for employment or if employed my dismissal for just cause. Gator BBQ and Matt Smith Catering may verify the information set forth on this application and obtain additional background information relating to my background. If you have questions/concerns about a current or future order, please contact us with this form! Due to the Canada Post strikes, we have been experiencing long delays for online orders. Please allow an extra 2 to 3 weeks for delivery. If you still have not received your packages by that time, let us know immediately. We apologize for the inconvenience and thank you for your patience. Do you have an event that needs catering but have further questions before deciding? Drop us a line! We would be happy to answer any questions/concerns you may have! Interested in fast paced, exciting and rewarding work? Are you interested in spending your summer traveling, serving your favorite BBQ to thousands of people across Canada and the Northern US? Send us a message here to learn more, or go straight over and fill out an APPLICATION now! 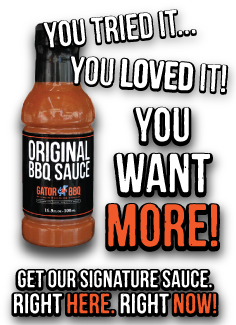 Did you have an amazing Gator BBQ experience? Could we have done better? Let us know here! All criticism is welcomed! Do you grant us permission to use your feedback as a testimonial? Please use this form for any general questions/comments/concerns that are not covered by any of the other contact forms.